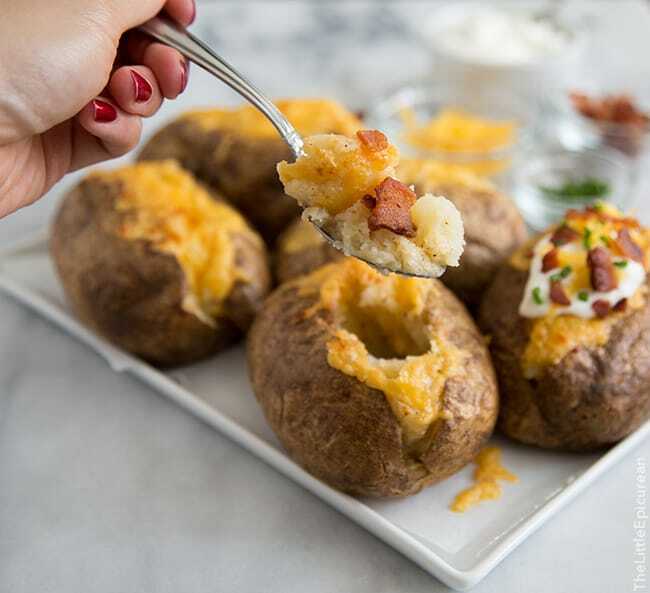 Cheddar bacon twice baked potato is the ultimate comfort food side dish. It’s impossible to feel sad while eating this combination of savory flavors. Ever have one of those days when everything seems to go awry? Earlier this week, I accidentally washed a brand new bright red shirt with a bunch of light colored clothing. I don’t need to explain what happened there. Then, I forgot that I had a pitcher of cold brew coffee that was supposed to be strained a day ago. To top it off, a new cake recipe didn’t work out. Those kind of rough days require a ton of bacon, cheddar, and potatoes. 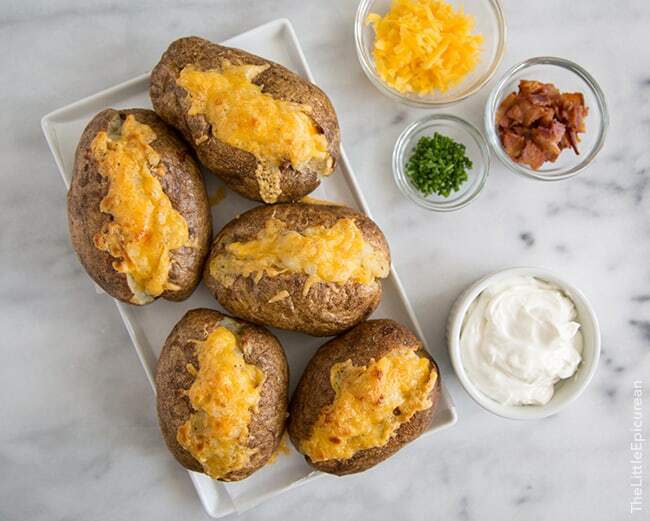 That’s where these cheddar bacon twice baked potatoes come into play. There is something so comforting about potatoes. It’s nearly impossible for me to be sad while eating potatoes (baked, fried, mashed, etc). No need for me to explain my love of twice baked potatoes, have a look at my mom’s famous twice baked ranch potatoes. Once the potatoes are stuffed, they can be kept frozen for longer storage or kept in the fridge until ready to reheat to serve. Preheat oven to 450 degrees F. Line baking sheet with parchment paper. Set aside. Scrub and rinse potatoes clean. Pat dry. Place potatoes on prepared baking sheet. Rub potatoes in olive oil. Season generously with kosher salt. Pierce potato with a fork, to allow steam to escape during cooking process. Bake for 50-60 minutes, until potatoes are tender and can easily be pierced with a knife. While potatoes are baking, cook bacon in a large skillet over medium heat until crisp. Transfer cooked bacon to a paper towel lined plate. Crumble cooked bacon and set aside. Reserve 2 -3 tablespoons of bacon fat and discard the rest. Remove potatoes from oven and allow to cool. Lower oven temperature to 350 degrees. Once potatoes are cool enough to handle, cut a slit lengthwise on each potato. Be careful, as potatoes will steam. Spoon out contents of potato and place in a large bowl. Gently smash into smaller pieces, but no need to make mashed potatoes. Add reserved bacon fat, butter, salt and pepper, half & half, and about 3/4 of shredded cheddar cheese to potatoes. Fold to combine. Spoon potato mixture back into empty potato skins. Sprinkle remaining shredded cheese over stuffed potatoes. Place stuffed potatoes back into the oven for another 15-20 minutes until potatoes are warm and cheese has melted on top. Remove from oven and garnish with sour cream, additional cheese, and crumbled bacon bits. Serve warm. Ahhh heaven in a mouthful!! Carby goodness as I like to call it! I like “carby goodness!” I’m gonna have to use that! Yay – it was my pleasure! I’m so glad we figured it out. And that you had these potatoes to comfort you. Cheese + potatoes? Definitely a cure-all. And ugh, I hate those “everything is going wrong” days! I am always nervous to update WordPress. Something goes wrong every single time and I end up having to contact my host to help me sort it out. So much valuable time is wasted on technical difficulties. 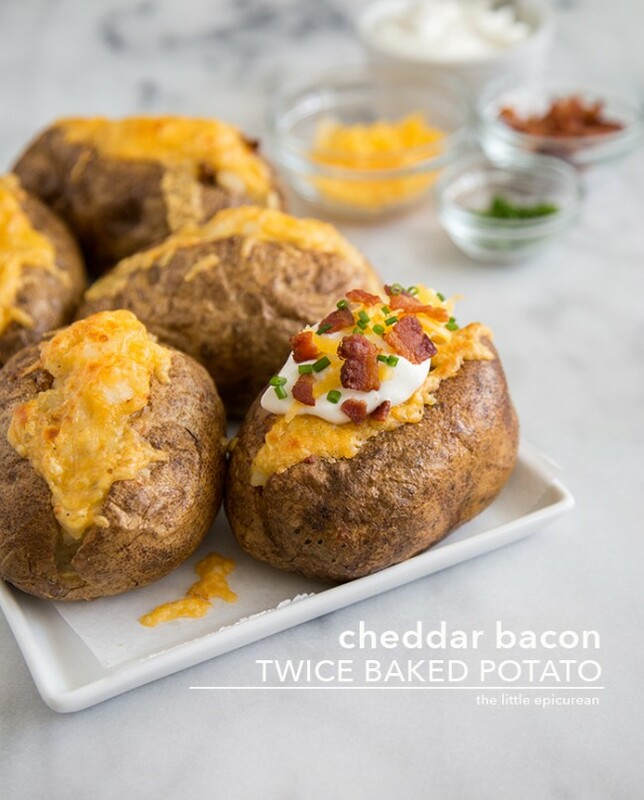 I will be sure to have one of these twice baked potatoes to relieve the stress next time! Cheese, Bacon and Potato has to be the ultimate flavour combination.. 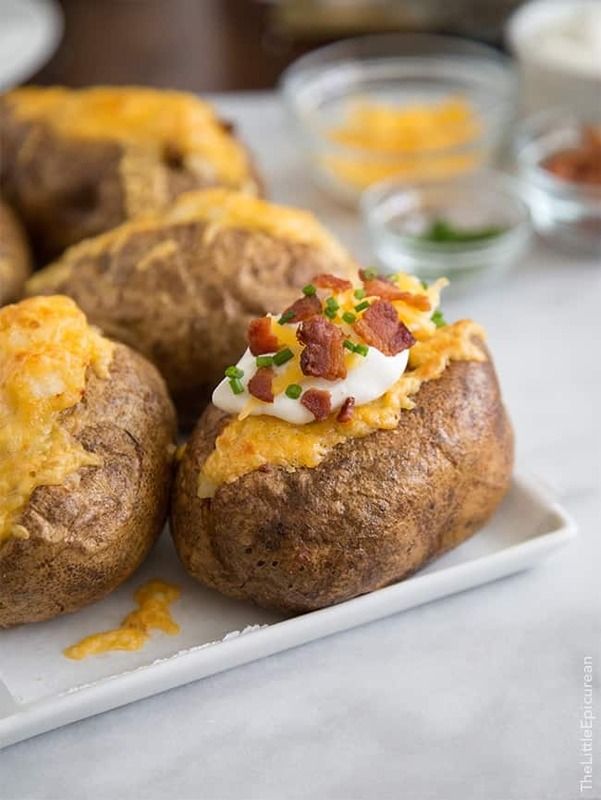 I can imagine how good these baked potatoes tasted, I must try the recipe! Sorry to hear about your almost meltdowns, but just wanted to say this recipe is awesome and I WILL be eating it this weekend. :) Hope you have a great weekend too!